Positive Detroit: Tree Lighting Kicks Off Campus Martius Park’s ‘Winter Magic’ Season This Friday! 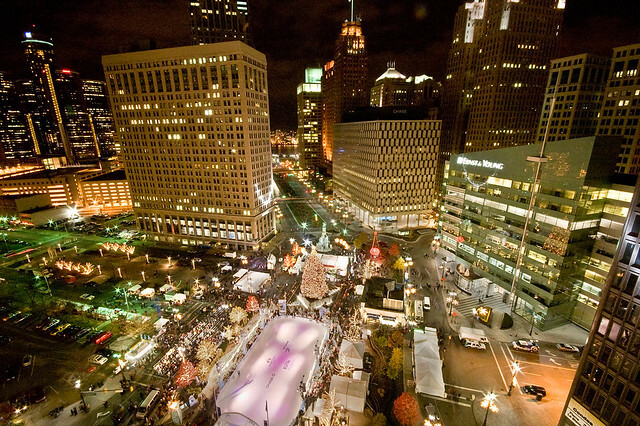 Tree Lighting Kicks Off Campus Martius Park’s ‘Winter Magic’ Season This Friday! This year, downtown Detroit will experience the kind of holiday season it hasn’t seen in decades. “Winter Magic,” Campus Martius Park’s seasonal celebration, will kick off on Friday, November 16 at 5 p.m. with the traditional Detroit Tree Lighting Ceremony presented by the DTE Energy Foundation. Quicken Loans is the presenting sponsor of the Winter Magic Season. “Holiday DLight: Made in Detroit” will bring retail back to downtown Detroit for the holiday season. The stores, sponsored by Quicken Loans and Somerset Collection’s CityLoft, will debut on Friday, November 16 and will be open Thursday-Saturday through December 22. “We are thrilled to make our traditional Winter Magic celebration even better with additional activities during which Campus Martius Park and Woodward Avenue will be bustling with events for people of all ages,” said Robert Gregory, President of The Detroit 300 Conservancy, the non-profit organization that oversees Campus Martius Park. Quicken Loans and Somerset Collection’s CityLoft are partnering to activate the storefronts on the 1200 block of Woodward, between Grand River and Gratiot. “We are very excited to partner with Somerset Collection to bring new retail to downtown Detroit for the holiday shopping season,” said Dan Gilbert, Chairman and Founder, Rock Ventures and Quicken Loans. This year’s 55-foot tall tree weighs over 10,000 pounds and has a 30-foot span of branches that will be decorated with more than three miles of wire and 19,000 LED lights. An additional 170,000 LED lights will be installed on 78 trees throughout Campus Martius Park and 32 trees along the 1200 block of Woodward between Grand River and Gratiot. Christmas Wonderfest Holiday Market & Holiday Cheer Garden Friday-Sunday from November 16 - November 25, Campus Martius Park will be home to the Christmas Wonderfest Holiday Market. More than 50 retailers will offer gifts including holiday imports, unique art and apparel, Detroit merchandise and more. At the Holiday Cheer Garden, guests can enjoy craft beers, holiday wines, warm winter cocktails and more from popular bars and restaurants, including E.G. Nick’s, which will have a special eatery. For more information about Winter Magic and Holiday DLight: Made in Detroit, please contact The Detroit 300 Conservancy at (313) 962-0101 or visit www.campusmartiuspark.org. For more information about opportunities in Detroit, please visit http://opportunitydetroit.com/.